This Thursday is Dakini Day. I’ll make an offering to the 21 Taras and recite several prayers at the small Tara temple in my house. Anyone is welcome to join me in the prayer. My house location: 129/908 Perfect Place, Ratanatibet Road. Praying time: 9-11.00 am. Vegetarian lunch will be provided. 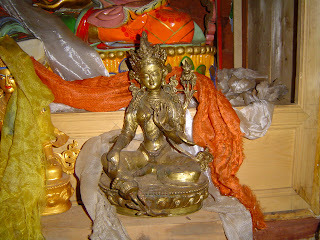 This picture is a statue of Green Tara taken from a temple in Tibet. Green Tara symbolizes compassion and protection from fear. When we encounter any fear in life, we can think of her, call her name and recite Tara mantra. This will dispel the suffering from fear. I’d love to go, I miss your Tara temple. But if it is very late at night, I don’t know how to go home. I made a mistake. The prayer will be on Thursday in the morning. Please join me. We can go to Chula together. I have class at 1.00 pm krab. Is that possible? Jampa Nyima always joins all the programmes. Please tell kandoma (mispelled) to name me it Tibetan language. My name is expected to be the most beautiful who is making merit all the time.